If you've read Rebel Heir (and if you've picked this book up, you should have because this is not a standalone), you've been hanging out with me on that cliff Ms. Ward and Ms. Keeland left us on, and probably waiting with bated breath to see what happens next. Allow me to tell you what happens next: - Emotional rollercoaster ride - All the feels - Sheer perfection in the ending As is usually the case in books by these authors, things didn't pan out exactly the way I thought they would. I started out a little frustrated with every single person and the entire situation and then as the story went on, I became completely wrapped up with it and absolutely emotionally invested. I wasn't 100% sold on Rush and Gia after Rebel Heir, but Rebel Heart sealed the deal for me and in the end, I really did love their story so much. There is a fair amount of angst here, and at times I felt like the story drifted a bit, but the ending? SQUEE. So much SQUEE. And I could not be more satisfied. It was an okay read but to much back and fort.. I think I got a whiplash from it all..
Beautiful conclusion to a wonderful story that will pull at your heart and capture your imagination. This story picks up right where you leave off once you finish reading Rebel Heir which I recommend you do before diving into this beauty. They are at a party and Gia see's someone she thought she would never see again and it turns out to be Rush's brother. Not ready to tell him she lets it dwell until the brother decides to get even with Rush and spill the beans. Of course that throws Rush into a tailspin with him and Gia in limbo until he can wrap his head around the news. This complicated tale will hold you in its clutches and have you wringing your hands wondering will they or won't they be together. The dynamic duo that is Vi Keeland and Penelope Ward are a POWERHOUSE, you can tell they put love and though into each and every book they turn out together. These books will not disappoint so pick up this twisty twosome (Rebel Heir&Rebel Heart) and see why everyone is swooning!!!! 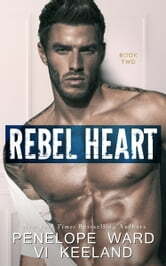 Rebel Heart by Penelope Ward & Vi Keeland is the nail-biting, angst-ridden, fabulous conclusion to the story of Gia and Rush that began in Rebel Heir. The twists and turns the story takes, the similarities between their situation now and that of their parents in the past is eerie and well-worked into the storyline. Rush and Gia are a powerhouse couple that rise above the challenges life throws at them but do so realistically. The choices they afce are life-changing and devastating and the fact that they take the care required to make their decisions is rare in a romance book. I loved this stunning conclusion and am just in love with both of these fabulous authors! Enjoy!